Matt Tifft picked up the 1st last-place finish of his NASCAR XFINITY Series career in Saturday’s VFW Sport Clips Help A Hero 200 at the Darlington Raceway when his #19 Ron John Surf Shop Toyota was involved in a two-car accident after 1 of 148 laps. The finish came in Tifft’s 35th series start. The 21-year-old driver and UNC college student from Hinckley, Ohio has this year become one of the most interesting stories in the XFINITY Series garage. Mentored by several drivers, including XFINITY Series part-timers Tim Schendel and Benny Gordon, the last ten years has seen Tifft jump from go-karts to NASCAR’s second-tier division. In 2014, he finished 8th in his Truck Series debut at Martinsville, and by the following season, both Toyota and Joe Gibbs Racing came calling. 2015 saw his XFINITY debut at Kentucky, where he drove a Gibbs car to a 10th-place finish. The next year, he scored his first pole at Talladega, scene of the first of back-to-back 8th-place runs. But, soon after, it all almost came to an end. During a routine appointment in June 2016, doctors discovered a brain tumor which required immediate medical attention. Within weeks, Tifft underwent surgery and was out of the driver’s seat at Gibbs. Doctors discovered the tumor was benign, and by September, he was cleared to race. Through it all, Tifft maintained a positive outlook, sharing his story on social media. He also didn’t lose his driving skills. At Kentucky, his first race back, he scored a career-best 5th, followed by an 8th at Charlotte and a 9th at Texas. By the end of the 2016 season, Tifft was announced as Gibbs’ full-time driver of the #19, replacing XFINITY Series champion and current Cup rookie Daniel Suarez. Coming into Darlington, the highlight of Tifft’s 2017 season came just six days earlier at Road America. In the final laps, it was Tifft who found himself in front, positioning himself for a first XFINITY Series win. 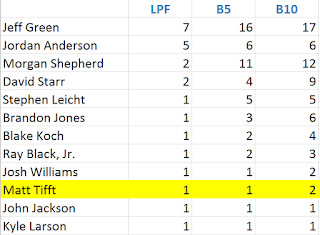 But, during those same laps, Jeremy Clements was charging through the pack, and caught Tifft for the lead coming to the white. The two made contact, sending both cars into a spin. While Clements managed to keep his car pointed straight, Tifft lost time getting back on course and was edged for 2nd by Michael Annett. Still, the 3rd-place run tied a new career-best, matching another 3rd earlier that month at Mid-Ohio. 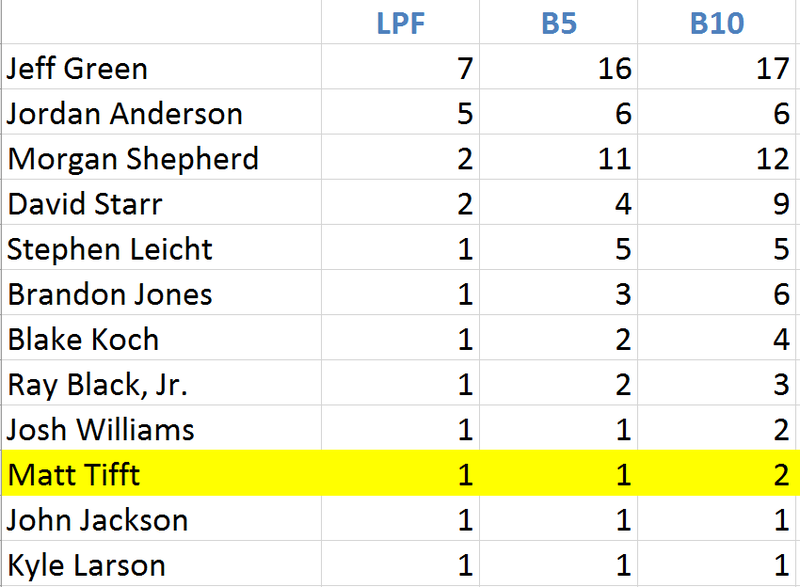 All together, Tifft sat 7th in the point standings after 23 races. Darlington’s third annual “Throwback Weekend” saw Tifft drive one of many tributes to Dale Earnhardt – specifically the #19 Belden Asphalt Chevrolet that “The Intimidator” raced in the NAPA National 500 at Charlotte on October 9, 1977. The car Earnhardt drove was owned by longtime owner-driver Henley Gray, who at the time had retired from Cup racing with 374 starts over 14 seasons without a win. That day, Earnhardt did no better – rear end trouble took him out of the race after just 25 laps, leaving him 38th in a field of 41 (the late Bruce Hill, who A.J. Allmendinger honored last year, took last). Tifft’s Toyota would carry a similar paint scheme, but with sponsorship from the Ron John Surf Shop. At the track, Tifft ran 17th in the opening practice session, 13th in Happy Hour, and came up just short of making the final round in qualifying, securing the 14th starting spot with a lap of 169.526mph. Just one driver was sent home after qualifying – the #15 Flex Seal Chevrolet of Reed Sorenson, who failed to complete a qualifying lap due to transmission issues. Starting last on Saturday was Mike Harmon, whose #74 Dodge for Veterans Motorsports, Inc. was brought to the track in a small white trailer parked near the paddock entrance to the garage area. The black car was wrapped in white and gold, honoring longtime NASCAR racer Red Farmer and his #97 Ford. Joining Harmon at the rear were Brandon Jones and Tommy Joe Martins, each sent to the back for unapproved adjustments. By the time the field entered the backstretch for the first time on Lap 1, all three had passed Morgan Shepherd, dropping the #89 Visone RV / Racing With Jesus Chevrolet to last. Then, coming onto the front stretch, trouble broke out. On Lap 2, Carl Long pulled his #13 OCR Gaz Bar Dodge behind the wall. The Motorsports Business Management crew looked under the car for a few moments before the driver re-fired the engine, drove around the garage building, and returned to the track through the backstretch pits. At this point, Long was in 39th, at least one lap down. Only then did Darlington’s track crew tow Tifft’s #19 back to the garage area, where crews removed the crumpled front valence and prepared to load it onto the truck. Next to arrive in the garage was Jeff Green, who pulled into the garage via the rear entrance around the time Ty Dillon recovered from his backstretch spin on Lap 9. Both Green and Long’s pit stalls didn’t have any sets of tires at the ready. Green’s stall had an extra generator cart from RSS Racing teammate Ryan Sieg’s team, as well as at least one crewman wearing a headset. Long’s pit stall had the #40 team’s war wagon, still covered after opening ceremonies. Long would pull into the garage a second time on Lap 32, and this time was done for the day. I had a chance to speak to both drivers, who finished 39th and 38th in the final running order. "It’s paying the bills,” said Green. “That’s all I’m doing, you know. . .We get to have a little fun, short lived time. But if I hadn’t had my career, you know, it’d be tougher for me to do it, you know what I mean? But I’ve been there, done that.” Green was also appreciative of his name staying out there in the NASCAR media. “Any time you get someone talking about you, it’s good.” The financial aspect of parking, particularly for a small team like RSS Racing, creates a delicate balance for “start-and-parks” between gaining a couple spots and risking damaging the car. “[Sometimes] we’re not really gaining anything by running 50 laps. But for someone like Morgan (Shepherd), he’s a start-and-park, a couple other of those guys, if we know they’ll start, we’ll try and outrun them, because it’s about a thousand dollars of difference for each spot, you know what I mean? That’s what we’re doing it for, the money, we’re not doing it for anything else. So if we can gain a couple of spots, that’s a couple of grand.” We at LASTCAR.info also presented Green with a shirt commemorating his 100 NASCAR last-place finishes. “I didn’t think I had 100 yet,” he said with a smile. Long, wearing the RoadLoans.com driver’s uniform from his attempt to make the 2006 Daytona 500, was trying to figure out the issue that forced him to make two trips to the garage. “Not real sure. Something in the suspension didn’t feel right, and it just got to where it was in a drift. My guys were stuck on pit road, and so they want me to look after it (laughs). . .I think the splitter’s bottoming out and going up the track and it’s just a handling issue and I’m not running this car for points, it weren’t no use when the leaders started catching me. I just save all this for tomorrow, so I can sweat it all out tomorrow.” When asked about his #66 Chevrolet on the Cup side, which he’ll drive in his first Southern 500 since 2005, Long was looking forward to it. “The car drives pretty good. I’m a little bit puzzled because I thought it drove pretty good, but I’m still two seconds slower than the other guys. So, drives good but don’t have any speed, so hopefully we can stay out of the way.” Long’s goal for Sunday was simple. “Finish." 37th went to Morgan Shepherd, whose pit stall had just one set of scuffed tires prior to the race, a small war wagon, and a bright orange cross that served as his pit board. NASCAR veterans Frank Warren and Billy Fulcher, both invited to the track by Premium Motorsports, were standing by the stall before the green flag. Warren was wearing one of his bright yellow team shirts and a Premium hat. During the opening laps, Morgan Shepherd was running at or near the back of the pack, trading spots with Mike Harmon. The veteran remained on the track through the race’s first four cautions, and was setting up to beat his record of 59 laps complete earlier this year at Loudon. He also stayed out during a round of pit stops, ranking him 2nd behind Jeremy Clements for a lap, then to the lead for two more. Shepherd was still leading the pack at the one to go signal before he pulled over off Turn 2, letting Joey Logano and the rest of the leaders form up for the start. It marked the first time Shepherd had led more than one lap in an XFINITY race since April 27, 2012, when he led 3 at Richmond. On Lap 54, just after the end of Stage 1, Shepherd pulled his car behind the wall and stopped next to a tent set up next to the small white trailer and pick-up truck his crew had driven to the track. With his wife Cindy standing by, Shepherd took his time getting out of the car, then retrieved his rolling tool box and worked his way through the drawers. With NASCAR officials watching, Shepherd took apart the carburetor and set to work on a faulty fuel pump. Although Shepherd did later remove the tapered spacer from the carburetor, he did also set to work on the fuel pump, working on his own car like the many great independents before him. Once the crew brought back his tires and war wagon, I spoke with him as he enjoyed a Mello Yello in his small white trailer. "It cut off,” said Shepherd, “and I thought the fuel pump quit on us, which it did. And I got over here and it picked back up, and I realized it went through the banking, it lost fuel pressure. The pickup’s on the right side.” It’s been a difficult year for Shepherd, who each week has enjoyed just a handful of laps in his 50th anniversary season. “We don’t have sponsorship to go out and race, buy tires and all that, buy engines, so we just run a little bit. But the car did cut off, lost fuel pressure. What it was, the fuel was just away from the pickup." Finally, when asked why he stayed out to lead those two laps when there’s only points for stage wins, Shepherd was clear. “I’m almost 76, and we led the race here at Darlington.” Nothing more needed to be said. For more on helping out Shepherd Racing Ventures, you can donate to his website at www.morganshepherd.com. The team also has hero cards printed with his gold-and-black 50th Anniversary paint scheme. Rounding out the Bottom Five was David Starr, whose #99 Chevrolet slowed suddenly down the backstretch in the early moments, then ultimately lost 16 laps to the leaders to finish the first car under power. *This marked the first last-place finish for car #19 in XFINITY competition since the 2015 finale at Homestead, where Jeff Green’s run in the TriStar Motorsports Toyota ended with transmission issues after 3 laps of the Ford EcoBoost 300. It was Green’s sixth last-place run in a row, setting a season-high record of 23 finishes for the year. 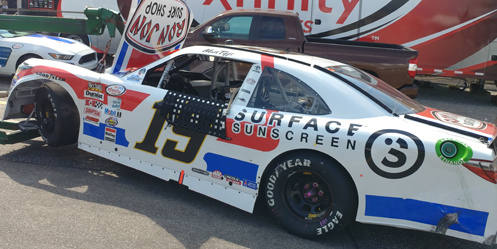 It is also the first last-place finish for car #19 in an XFNIITY race at Darlington.